Zynga's sliding numbers means it will have to add millions of new daily average users every quarter just to break even. Concerns about the future of casual gaming giant Zynga continue to grow in the wake of its December IPO. Ten percent of its billion-dollar valuation evaporated within days and future pain seems almost certain unless the company can do something to halt the ongoing and rather dramatic slide of its daily average user [DAU] numbers. And that "something," according to Cowen and Co. analyst Doug Creutz, will have to be big. Creutz said in his latest report that Zynga's two newest games, Hidden Chronicles and Scramble With Friends, haven't managed to achieve a level of success anywhere near its previous releases. Hidden Chronicles, for instance, hit 750,000 daily average users in 12 days, whereas both CastleVille and Empires & Allies had broken the five million DAU mark over the same period. 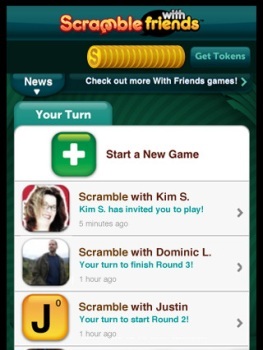 Scramble With Friends, meanwhile, languishes "well outside" the App Store top 20. Both games could grow to become big players, but as Creutz explained, that kind of slow, steady climb "has not been the general pattern for Zynga's launches over the past year." He also pointed out that Zynga games that are at least three months old have suffered an average quarterly loss of daily average users of 18.4 percent over the past two years, which means that tepid responses to its new games could leave the company in a very bad spot. "Assuming Zynga averages a 20 percent quarterly rate of decline for titles beyond their launch windows in 2012, the company must add 9-10 million DAUs per quarter from new games just to keep total DAUs constant," Creutz said. Zynga stock is currently trading at around $8.78.